2. 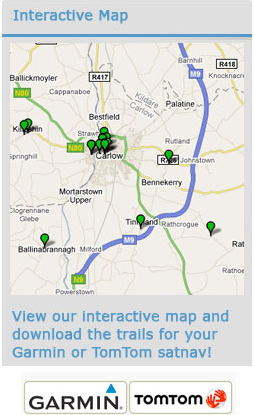 Carlow College, otherwise known as St. Patrick’s College is Ireland’s oldest third-level Catholic College. It was founded in 1782 and opened in October 1793 following the relaxation of the Penal laws which restricted Catholic education. 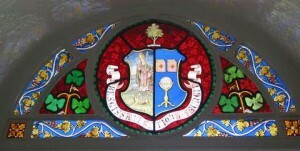 Dr. James Keeffe, Bishop of Kildare and Leighlin along with his successor, Bishop Daniel Delany, were the driving forces behind the foundation of the college. Its aim was to educate boys for the professions and for the priesthood. 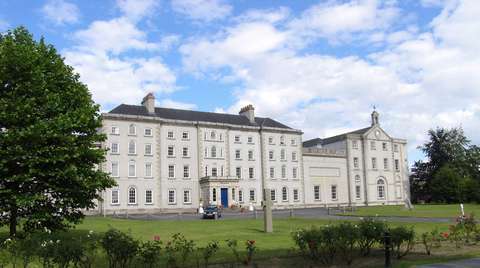 During the period 1793-2001 over 3,300 students of Carlow College were ordained priests and they have served all over the world. The college has also educated generations of politicians, poets and leaders. The earliest part of the building is the large central block which is nearly 37 metres long. An extension was soon needed and a new building plan was initiated in 1817 with Thomas Cobden as architect. The south wing (to the right when facing the college) was added in 1819 and was connected to the existing college by a two-storey link building. The main north wing was built between 1821 and 1835 on a much grander scale. The front façade is very different from the original building but the use of circular headed windows creates a sense of unity. It contains a very fine cantilevered granite staircase leading up from a granite paved entrance hall. A large hall with semi-circular apse, once the college chapel, is now named the Cobden Hall and is used for College and public events. The chapel of the Sacred Heart in the Hiberno-Romanesque style is particularly interesting. 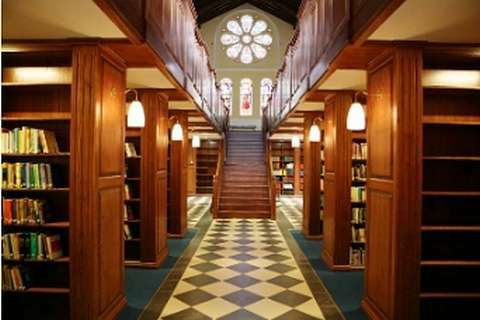 It was erected to mark the centenary of the college and now functions as the College Library. An exhibition relating to the history of the college can be seen in the corridor leading into the Library. In 1832 the college entrance gate and gate lodge were built, almost certainly by Cobden. The lodge is a small two-roomed building with a doorway under a classical pediment and flanked by two Greek Doric columns. 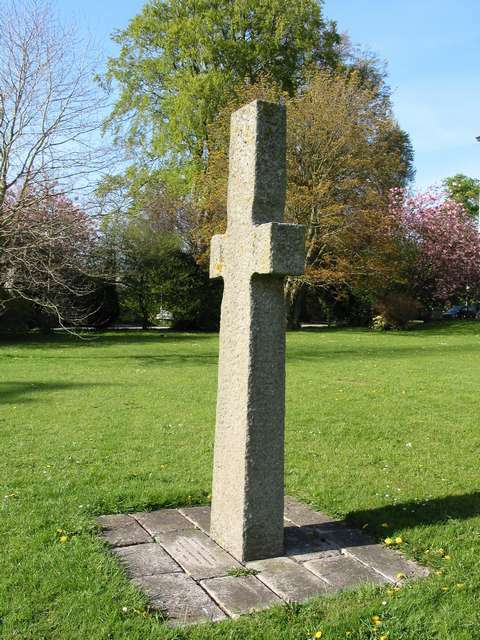 To mark the bicentenary of the opening of the college an exact replica of the plain un-inscribed high cross from nearby Sleaty was erected in the grounds. Immediately opposite is a modern work entitled Sun Stone. This is by the German artist Paul Scheidner and it is aligned with the sun at the summer solstice. Lecture rooms in the college are named after famous alumni. The John England Room is named after the first bishop of Charleston, USA (1820-42), while the Therry Room commemorates a pioneer of the Australian Church. Famous lay alumni include James Fintan Lalor, the agrarian agitator and social activist, the Fenian John O’Leary and Frank O’Meara, the impressionist painter. Open: Daily. Entry into the College buildings is restricted at certain times. Visitors should report to the receptionist at the main entrance. Penal Laws – Legislation passed between 1695 and 1728 which severely curtailed the practice of the Catholic religion in Ireland and the participation of Catholics in public life. Romanesque – Style of early medieval architecture characterised by round arches. Sometimes called “Norman”.